On May 23, 2014, a devastating fire came within a hair's breadth of destroying the stunning Glasgow School of Art, a masterpiece of architecture designed over 100 years ago by modernist trendsetter Charles Rennie Mackintosh. (See Mad for Mod postings of May 23 and 24.) Design aficionados all over the world despaired to hear this news. Eight months later, however, reconstruction is well underway, and due to quick action by the heroic firefighters of Glasgow, much of the building's exterior and 70% of its contents were saved. Author and international travel director Joemy Wilson, Mad for Mod's first-ever guest blogger, traveled to Scotland recently, and generously contributed this optimistic report on what she saw. Thank you, Joemy! Last autumn, my husband, Jon, and I took a long-awaited trip to Scotland. I was especially looking forward to getting lost on the lonely single-track roads of the magnificent Highlands. 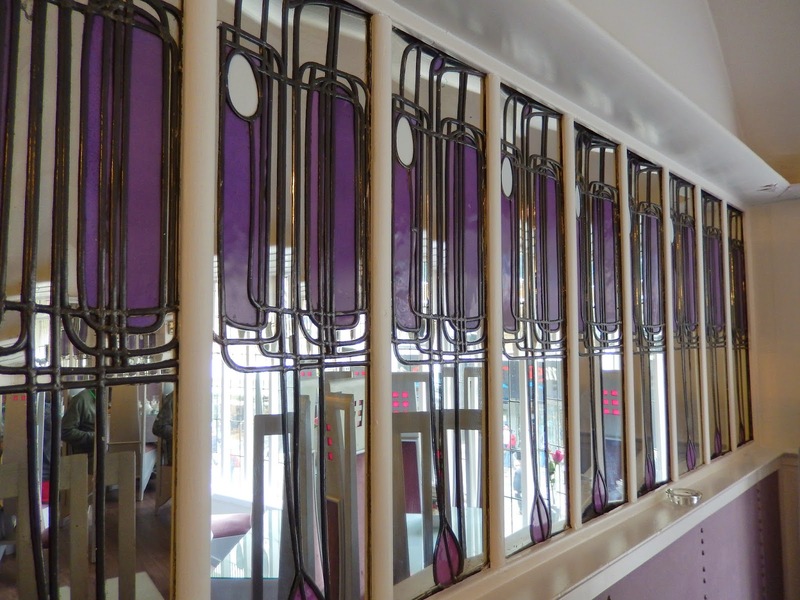 But first, I wanted to visit every Charles Rennie Mackintosh building that three days in Glasgow would permit. At the top of my list: one of Mackintosh’s acknowledged masterpieces, the Glasgow School of Art, built more than one hundred years ago. In May of 2014 the building had suffered a tragic fire that destroyed its iconic library and a number of its graduating students’ final art projects. I was eager but apprehensive. What would be left to see? Will the building live again? The GSA website said that tours were still being offered, so upon arrival in Glasgow we dumped our bags at the ultra-hip CitizenM Hotel and walked the few uphill blocks that took us to the school. We got there just in time for the first tour of the day and were lucky enough to draw Georgia, a current student, as our guide. Her major is painting but she loves architecture, and especially the great CRM. The venue has had to adapt its tour drastically since the fire, of course. Because the interior has been closed to visitors for several months, we began at the undamaged eastern side and continued around the block. Georgia pointed out the ornamentation: the symbol of St. Mungo, with the bird, tree, fish and ball; and the Glasgow Rose elements in front of the windows. She told us Mackintosh’s story, from student to master architect. The • Glasgow • Society • of • Lady • Artists •1882. We continued around the block. There was the library tower, covered in scaffolding. It was crawling with the most enthusiastic hardhat workers I’ve ever seen. They were calling to each other cheerfully, giving every indication that it was a personal joy for them to help recover this cultural treasure for Glasgow and for the world. Sunlit view of library at Glasgow School of Art. The library was destroyed in the fire. Georgia showed us a photo of the singular library interior, which she said will be restored down to the most minute detail. 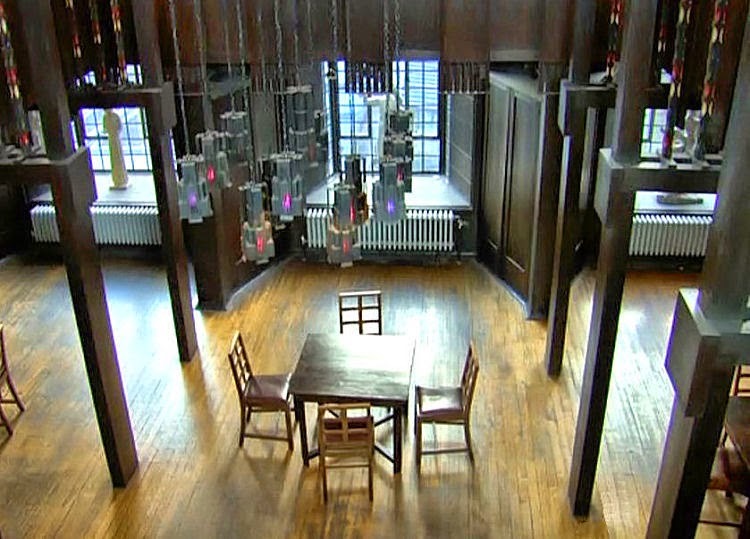 It will probably take five years, but fortunately, she told us, it was “one of the most photographed rooms in the world.” Also, providentially, there is a 360° computer rendering of the space, and everyone is confident that Mackintosh’s vision can be reproduced. Skilled craftsmen are already researching the proper materials, a phase that alone will probably take at least a year. 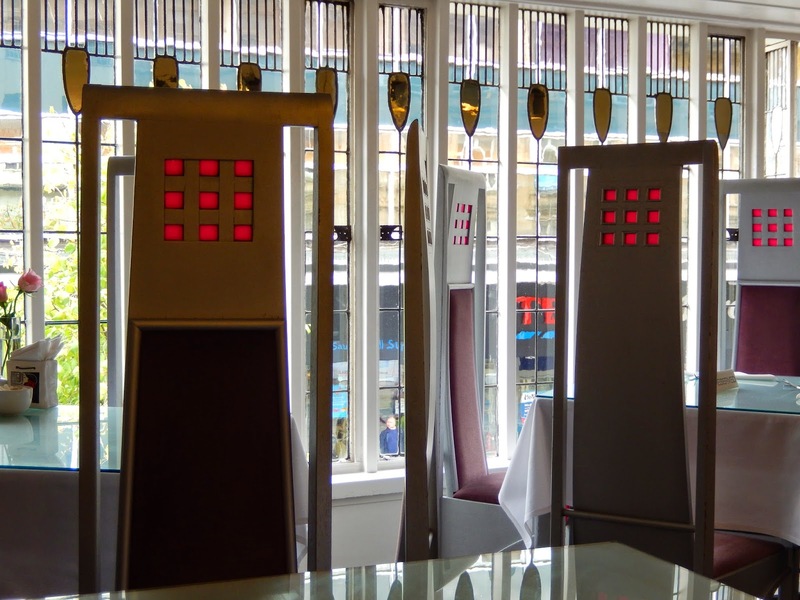 Greatly cheered, we went off to celebrate with lunch at the nearby Willow Tea Rooms on Sauchiehall Street. As we sat in Mackintosh’s gorgeous Room de Luxe, we clinked teacups in a toast to a genius architect whose masterpiece will certainly live again. While I nibbled on my sandwich, I thought of the brave firefighters whose brilliant strategy of forming a human wall up the west end of the main staircase probably saved the vast majority of the school building and its priceless artwork. I thought of the archives that were miraculously saved. I thought of those animated construction workers, cheerfully toiling away to resurrect a treasured icon. And I thought of the phoenix rising from its ashes, and how we can look forward to returning in a few years to see the restored library in all its glory. Front entrance to GSA, Renfrew St.
link here to my article originally published in Style 1900 magazine.